I developed a taste for it when I lived in Santa Cruz, California. It was only available at one of my favorite diners for a few months each year, but I took full advantage of it when it was “in season”. 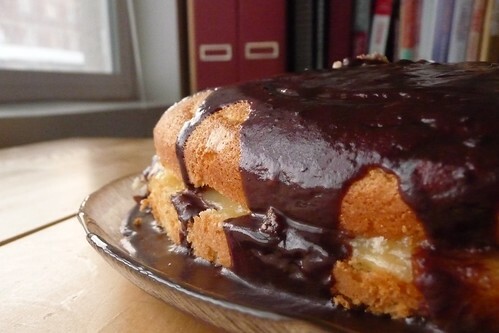 When my birthday came around last week, I decided what I wanted was Boston Cream Pie. (When else do you get to have an excuse to have your cake and eat it too?) I haven’t had any Boston Cream in probably two or three years. It’s not very popular in local restaurants that I’ve seen here in Utah, though you can find inferior imitations at the local megamarts. But how to make it? I have to say that the sponge cake and pastry cream came out absolutely delicious. I was not happy, however, with the glaze. Not at all. Too sweet in all the wrong ways and too thin to effectively coat the top since most of it ran down and puddled around the bottom. In the recipe below, I gave my favorite ganache recipe by Alton Brown, which I really, truly should have used instead. Plus, I would have liked it if the cake hadn’t stuck. I would have loved to try this new method for slicing a cake layer in half but I stupidly used non-stick spray + flour for the cake pan preparation and it caused part of the cake to stick. Badly. So badly that it ripped at an angle and I basically trimmed the bottom layer so it would lie flat. Every time I do this, I swear I will use Crisco + flour just like I have for my entire life and every time I forget, I wind up swearing at this result. Still tasted good though. Isn’t that the most important thing in the end? I thought so. Preheat the oven to 350F. Grease and flour a 9″ cake pan. Whip egg whites until foamy, adding 3 tbsp sugar gradually and continuing to whip until stiff peaks form. Make sure the bowl and beater(s) are sparkling clean and dry before you begin. Set aside. In a separate bowl, cream together the remaining 1/2 cup of sugar and butter until light and fluffy. Add the egg yolk and vanilla extract, beating for another minute or two until well combined. Sift together the flour, baking powder and salt, then slowly beat in, alternating with the milk, until fully combined. Stir in a quarter of the egg whites into the cake batter to lighten it, then gently fold in the remaining egg whites. Pour the batter into the greased cake pan and bake for 35 minutes. A toothpick or wooden skewer inserted in the center should come back cleanly. 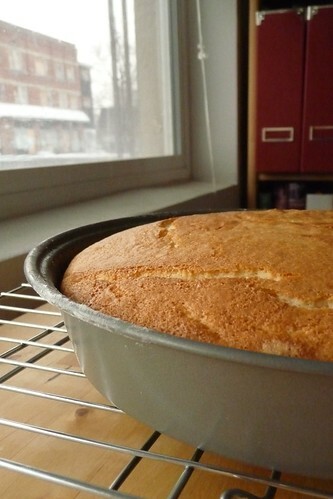 Cool in the pan for 10 minutes, then transfer cake to a rack to cool completely. Chill the entire cake in the fridge for at least one hour so that the glaze can set before serving. Beat egg lightly and set aside. Combine sugar and cornstarch in a small pot or a deep skillet and begin heating on medium heat. Gradually add milk and whisk to blend. Bring to a boil and cook for about a minute, stirring constantly. Remove from heat. Temper the egg by stirring in a quarter of the hot milk mixture (slowly! ), then add the egg-milk mixture gradually into the remaining milk mixture while stirring constantly. Place back on medium heat and cook for another minute or until thickened. Do not stop stirring! Remove from the heat and stir in the vanilla. Pour into a bowl and cover with plastic wrap, pressing it onto the surface so that a skin doesn’t form, then refrigerate until needed. Not the horrid stuff I described above but a delectable ganache frosting. This, in short, is the frosting I wish I had used. I’ve used this ganache over the past several years and always been pleased with it. Combine the two ingredients in a microwave-safe bowl. Heat on 50% power until chocolate is mostly melted. Stir well to finish melting and combine. Allow to cool to room temperature before spreading. Alternatively, whisk on high speed with a mixer to make fluffy ganache frosting. This entry was posted in american, cakes, Dessert, untranslated. Bookmark the permalink.